Last March I featured paper twine spring designs of Karin Eisele as seen on her blog Paperilla [edit: no longer available]. 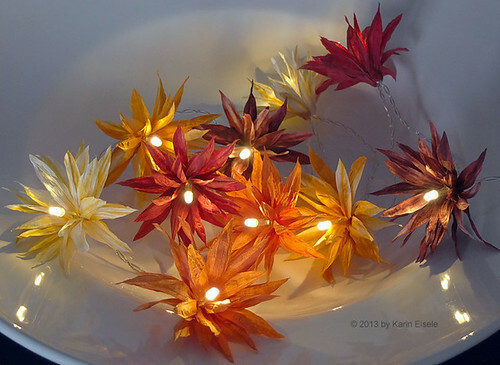 Now that we're quickly approaching the change of seasons it's time to feast our eyes on Karin's autumnal images... each one is as creative as the next! 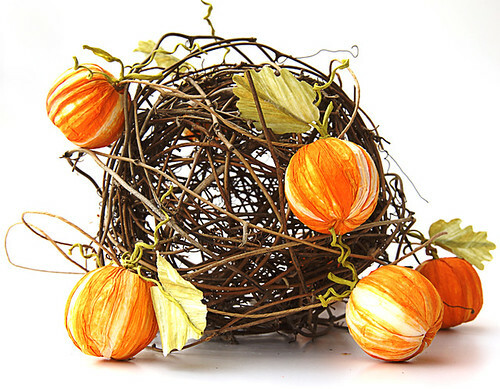 Her blog has been renamed Papiergarn (Paper Yarn Studio) [edit: has been set to private] and Karin continues to make beautiful home decor - centerpieces, ornaments, baskets, and even decorative lighting from twisted paper yarn. 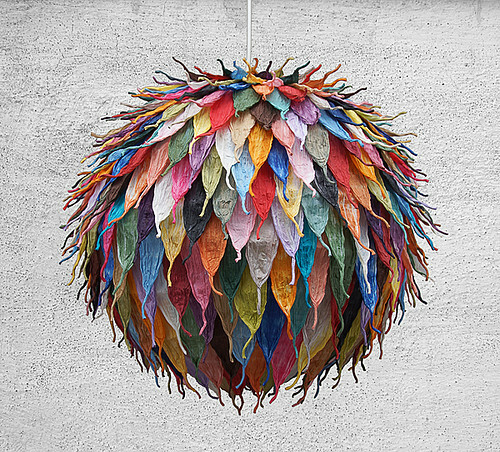 Her designs are stylish and purposeful - the very kind of paper objects I like best! Paper yarn is also referred to as paper twine or paper string and is spun from ribbon-like strips of strong washi paper. There's no question it's an intriguing material that can be shaped, woven, knitted, or crocheted in a myriad of ways. 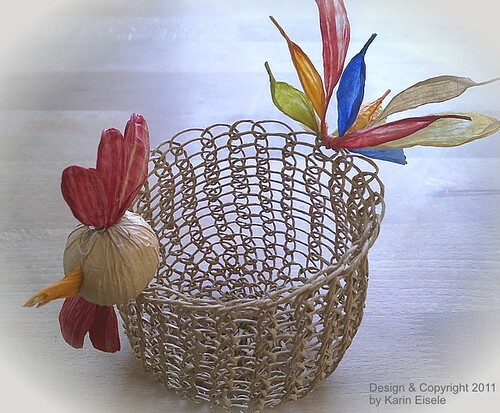 Karin began working with paper yarn about ten years ago after seeing it at a creative exhibition. Now she teaches paper yarn workshops, displays her work at craft shows in Germany, and sometimes travels to other countries to lead classes. Paper yarn is easy to work with. There are thick or thin yarns twisted like a cord. These cords can be processed for knitting, crocheting, and weaving. 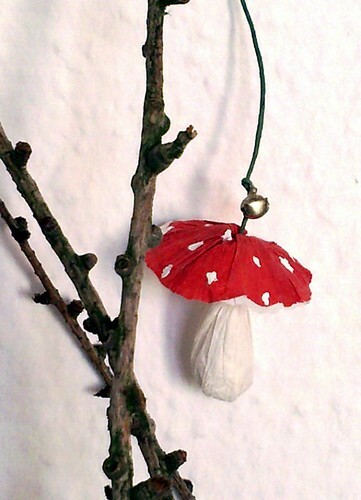 For the flower lights, for example, the cording is unfurled. In this state it's easily shaped and cut into petals. It is the same with figures, sheets, and much more. Karin has a busy autumn planned with lots of new projects to unveil and classes to teach. I look forward to following along with her blog to see the very latest. Papiergarn posts are in German, but you'll find a translate button at the top of the page. Karin's DaWanda shop Starpoint ships handmade items, Finnish paper twine supplies, as well as her own kits and how-to manuals throughout Germany. 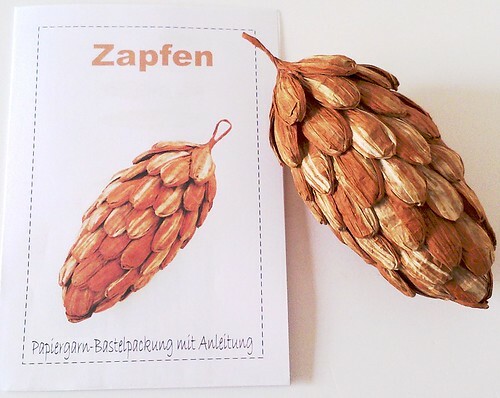 For those of us in other countries, paper twine suppliers show up readily in an online search. Williams-Sonoma in the U.S.carries a couple of colors and there are quite a few Asian stockists as well. PaperPhine in Austria ships internationally and has been a frequent sponsor here at All Things Paper. And speaking of sponsors, I launched a brand new advertising program yesterday. If you are interested in promoting your creative business (not necessarily having to do with paper) via an ad or giveaway during the upcoming holiday shopping season and beyond, there's no better time to get started. I wish you a great weekend, perhaps one that involves making something beautiful! SO very beautiful . 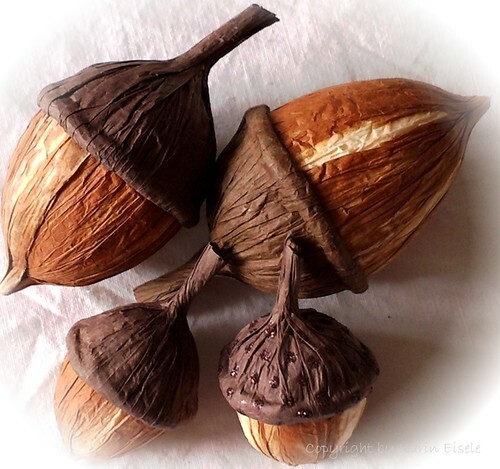 I love the colour and texture of this paper and Karin's beautiful creations with it. Such beautiful items. Such gorgeous colours.